The 2017/18 Eredivisie campaign got underway with last season’s European play-off winners, FC Utrecht picking up where they left off by hitting hosts, ADO Den Haag for three without reply at the newly renamed Cars Jeans Stadion on Friday evening. Despite having four competitive outings already under the belt, the away side were very nearly caught cold by their hosts when Sheraldo Becker was denied by David Jensen, after the former Ajax youngster found himself away and clear – latching onto a flick-on by the returning Lex Immers, just two minutes in. However, despite the home side’s promising start, just a quarter of an hour in, it was Erik ten Hag’s side who broke the deadlock when new arrival, Cyriel Dessers found himself in the right place at the right time to tap the ball into an empty net after strike partner, Gyrano Kerk had rattled the frame of Robert Zwinkel’s goal with a blockbuster from well outside the area. Having endured a torrid campaign both on and off the field last term, the home faithful had hoped the return of club icon, Immers and a slew of summer recruits that included Norwegian forward, Bjorn Johnsen, would lead to a reversal of fortunes this season and the former Hearts striker very nearly clawed the home side level – striking the foot of Jensen’s right hand upright with a low drive from just outside the area nine minutes before the interval. Despite, no doubt, having one eye on the 1st leg of their upcoming UEFA Europa League play-off tie against Zenit St. Petersburg on Wednesday evening, ten Hag’s side remained focused on the task at hand and doubled their advantage ten minutes into the second half – former SC Cambuur midfielder, Sander van de Streek heading a perfectly weighted cross from the left by substitute, Urby Emanuelson beyond the reach of Zwinkels. Despite finding themselves two goals down, the hosts weren’t about to meekly surrender and the home side continuously threatened to cut the away side’s advantage in half throughout the second period – a fierce Tom Beugelsdijk header rattled Jensen’s crossbar in the 65th minute before Becker then drew a smart near-post save from the visiting ‘keeper a minute later and Johnsen saw his close range header clawed over the bar by the 25-year-old Dane two minutes after that. Yet, try as they might, Alfons Groenendijk’s side failed to make the break though and, when Dessers – who was recruited from NAC Breda over the summer after bagging 29 goals in his 40 outings in all competitions last term, was sent clear by an incisive through ball by Zakaria Labyad to net his second of the evening and the away side’s third with a cool finish under the onrushing Zwinkels, there was no coming back for the hosts. 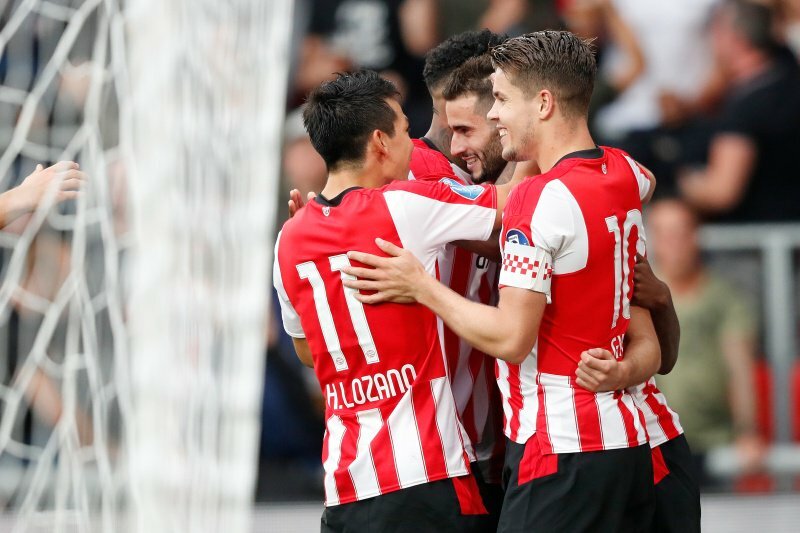 Saturday’s Eredivisie action got underway at De Koel where newly promoted VVV Venlo put the rest of the top flight on notice by hitting undermanned Sparta Rotterdam for three. Having both returned to the top flight of Dutch football as champions of the second tier, Maurice Steijn’s men will hope to replicate Sparta’s survival feat of last term – Alex Pastoor’s side’s fifteenth place finish not only preserving their Eredivisie status but also ensuring that they did not have to negotiate the lottery that is the end-of-season promotion/ relegation play-offs. However, having lost two key defensive components in Rick van Drongelen (Hamburger SV) and Denzel Dumfries (Heerenveen) just weeks before the beginning of the new campaign, Pastoor’s side found themselves on the back foot and, after almost falling behind in the 12th minute when Michel Breuer cleared a goal-bound effort from Tarik Tissoudali off the line, the visitor’s resistance was eventually broken a minute before the break – Clint Leemans seeing his low drive from well outside the area wrong-foot Roy Kortsmit in the Sparta goal. Buoyed by their half time lead, the hosts emerged from the interval with a spring in their step and having seen both Lennart Thy and Vito van Crooij hit the woodwork within seconds of the restart, the home side doubled their advantage three minutes into the second half – Tissoudali tucking the ball under an exposed Kortsmit with the Sparta rear guard at sixes and sevens after the visiting ‘keeper had denied full back, Tristan Dekker just seconds earlier. Any hope, Pastoor’s men might have harboured of clawing their way back into the match disappeared six minutes from time when referee, Jochem Kamphuis gave Julian Chabot his marching orders after the centre half was shown a second yellow card following a body chack on van Crooij. The home side soon made their numerical advantage count by adding their third a minute into added time – Thy picking out van Crooij who, having burned off Breuer, chipped the ball delightfully over the onrushing Kortsmit to bag a goal that his individual performance richly deserved. Having endured a humiliating exit from the 3rd qualifying round of the UEFA Europa League at the hands of Croatian outfit, NK Osijek, the pressure was on PSV Eindhoven coach, Phillip Cocu to silence the naysayers who – in the wake of their European exit, had also written off his side’s title chances. However, things appeared to be going from bad to worse when Dabney dos Santos handed visitors, AZ Alkmaar the lead with just eighteen minutes on the clock at the Philips Stadion – Wout Weghorst getting the jump on Joshua Brenet down the right before pulling the ball back low to the waiting dos Santos who drilled the ball past Dutch international, Jeroen Zoet. Despite the away side continuing to look the more likely to score, the hosts were back on level terms just after the half hour mark – new recruit, Hirving Lozano cutting in from the left and leaving Ron Vlaar for dead before catching out visiting ‘keeper, Marco Bizot with a low drive that surprisingly beat 26-year-old at his near post. Indeed, PSV’s newly acquired Mexican marksman could have netted a second just five minutes later but for the intervention of Jonas Svensson whose goal-line clearance kept John van den Brom’s side on level terms before Lozano again threatened to hand the home side the lead heading into the half time interval only to see his effort cannon back off Bizot’s crossbar after finding himself one-on-one with the visiting ‘keeper just a minute later. However, despite squandering a number of chances to take the lead, Cocu’s side were almost made to pay for their profligacy when Iranian international, Alireza Jahanbakhsh saw his curling effort from just outside the area strike Zoet’s left hand upright three minutes before the break. Having had a lucky escape shortly before the interval, the home side emerged for the second stanza with renewed purpose and took the lead just three minutes after the restart – Gaston Pereiro flashing past a static Svensson on the left before lashing the ball beyond the exposed Bizot. Fourteen minutes from time the hosts looked to have sealed all three points when Dutch international, Marco van Ginkel added a third from close range after Bizot could only parry a Pereiro header into the path of the Chelsea loanee. Despite enjoying a two-goal advantage the points were anything but safe as the last few minutes proved to be anything but a formality for the home side who were left reeling when referee, Bjorn Kuipers awarded the away side a penalty – the official adjudging that van Ginkel had hindered the run of Jahanbakhsh, leaving Weghorst to send Zoet the wrong way from the resultant spot-kick nine minutes from time. Having seen one of their fellow title rivals get off to a winning start, AFC Ajax arrived in Almelo for their meeting with Heracles, aiming to avoid the sort of patchy form that ultimately derailed their title chances in the opening weeks of last season. Thursday sees Ajax play host to Norwegian outfit, Rosenborg bk in the play-off round of the UEFA Europa League – the competition which Ajax graced the final of last term, and, as such, following their disappointing exit on away goals at the hands of Nice in the 3rd qualifying round of the UEFA Champions League, Marcel Keizer’s men will be under pressure to secure a place in the group stages of European club football’s second tier competition. Despite having this weight of expectancy in the back of their minds, following a goalless opening period, Keizer’s men emerged for the second half the brighter of the two sides and, after seeing left back, Mitchell Dijks strike the foot of Bram Castro’s left hand upright five minutes after the restart, the away side broke the deadlock – Hakim Ziyech capping a marauding run and cut-back from Amin Younes by smashing the ball past a static Castro from just inside the area just after the hour mark. Shortly before the match it had been revealed that, with a proposed switch to Tottenham Hotspur on the horizon, Ajax’s Colombian centre half, Davinson Sanchez had been withdrawn and the 21-year-old’s absence would ultimately have a telling effect as the home side turned the score-line on its head to record a first win over their illustrious opposition in 52 years. Ajax’s lead lasted just nine minutes before the returning Paul Gladon stole a march on Matthijs de Ligt to level the scores in the 65th minute – Brandley Kuwas getting the better of Dijks on the right before threading the ball through for the Wolverhampton Wanderers’ loanee to tuck beneath an exposed Andre Onana. Then, with their rear guard looking progressively stretched as the away side pressed more and more numbers into the attack, Kuwas capitalised on the copious amount of space he was afforded to cut in from the left and bend the ball superbly beyond the flailing left hand of Onana to put the home side into a lead they wouldn’t relinquish eight minutes from time. With the visitors’ desperation mounting, Ajax goalkeeper, Andre Onana threw himself into the mixer in an attempt to find an equaliser. However, despite the ball ending up in the back of the host’s net, the goal was ruled out after Onana’s challenge on his opposite number, Castro, following a Ziyech corner from the right, was deemed illegal by referee, Kevin Blom in the sixth minute of added time. While one newly promoted side enjoyed their return to the top flight another were given a torrid time in Arnhem as cup-holders, Vitesse hit play-off winner’s NAC Breda for four at the GelreDome on Saturday night. It took the home side just two minutes to break the deadlock – former Heracles man, Thomas Bruns sweeping an Alexander Büttner cross from the left beyond the despairing dive of visiting ‘keeper, Andries Noppert. The hosts doubled their lead eighteen minutes later – Bryan Linssen stabbing the ball home from close range after an initial effort by Tim Matavz sat up perfectly for the ex-Groningen forward. Having escaped conceding a third when a deflected Navarone Foor effort from just inside the area cannoned back off Noppert’s crossbar in the 26th minute, a miserable half of football was compounded for Stijn Vreven’s side when another of the host’s summer recruits, Matavz made it three just after the half hour mark – the Slovenian forward heading a pinpoint right wing cross from Rashica beyond Breda’s 23-year-old glovesman. The visitors did briefly give themselves a glimmer of hope when French forward, Thierry Ambrose pulled one back for the newly promoted side with twenty one minutes left to play – the Manchester City loanee beating home ‘keeper, Remko Pasveer with a looping header after being found by another man on loan from the blue half of Manchester – Spaniard, Manu Garcia. However, after posting an impressive if ultimately unsuccessful display against reigning league champions, Feyenoord in last weekend’s Johan Cruijff Schaal, Henk Fraser’s side made sure of all three points by adding a fourth through Milot Rashica thirteen minutes from time – the 21-year-old Kosovar international weaving this way and that on the edge of the area before beating Noppert with a well-placed low drive. Sunday’s Eredivisie action got underway at the MAC3PARK stadion where the John van ‘t Schip era at PEC Zwolle got off to a winning start with the hosts hitting visitors, Roda JC for four. However, it was the away side, having escaped the drop by the skin of their teeth last time out, who hit the front through Feyenoord loanee, Simon Gustafson – the Swede turning Dirk Marcellis inside out before slipping the ball beyond the returning Diederik Boer after being inadvertently slipped in by an errant ball from Zwolle’s Mustafa Saymak. Despite looking set to take their advantage into the break, Robert Molenaar’s side found themselves back on level terms a minute into added time at the end of the first half – Marcellis glancing home a Younes Namli corner from the right at the near post. Buoyed by the equaliser, the hosts soon took the lead themselves, though it arrived from the most unlikely of sources – Adil Auassar putting through his own net from close range as he attempted to cut out a Bram van Polen cross from the left eight minutes into the second half. However, Molenaar’s troops wouldn’t go down without a fight and, nine minutes later, were back on level terms – referee, Bas Nijhuis pointing to the spot after van Polen had brought down Mikhail Rosheuvel just inside the area, leaving Gustafson to send Boer the wrong way from the resultant penalty. Despite being pegged back by their visitors, it took just three minutes for the hosts to reassert their dominance – Saymak making amends for his earlier error by beating PSV Eindhoven loanee, Hidde Jurjus to a long hanging punt from Ryan Thomas to loop the ball beyond the stranded 23-year-old and into the back of the net in the 66th minute before van Polen made sure of all three points by adding a fourth for the home side sixteen minutes from time with a long range drive from just outside the area. Having secured their first league title since 1999 last time out, reigning champions, Feyenoord began the defence of their crown by squeezing past a dogged FC Twente side at De Kuip on Sunday afternoon. After topping the Eredivisie goal-scoring charts last term, Nicolai Jorgensen picked up where he left off by firing the home side into the ascendancy after twenty three minutes – the returning Jean-Paul Boetius showing some deft control to breeze past Hidde ter Avest before hitting the by-line and pulling the ball back into the path of the onrushing Jorgensen who poked the ball past the away side’s newly recruited Belgian glovesman, Jorn Brondeel from close range. However, despite enduring a five-game goal-scoring drought in pre-season ahead of making the trip to Rotterdam, Rene Hake’s side found themselves back on level terms in spectacular fashion seven minutes before the break when Fredrik Jensen beat 19-year-old debutant, Justin Bijlow – who was standing in between the posts with both Brad Jones and Kenneth Vermeer ruled out through injury, with a rocket of a strike from just outside the area. Having seen fellow title contenders, Ajax slip up in Almelo the night before, Giovanni van Bronckhorst’s side were keen to capitalise on the profligacy of their bitter rivals and the hosts did just that in the 61st minute – Steven Berghuis celebrating penning a multi-year deal at De Kuip after enjoying a successful loan spell at the club last term by popping up at the back post to head a perfectly weighted Jen Toornstra free kick from the left beyond the despairing dive of Brondeel. At the same time, Feyenoord’s Rotterdam neighbours, Excelsior were enjoying a rare away victory in Tilburg. Having once more defied the odds to retain their top flight status last time out, Mitchell van der Gaag’s side unexpectedly took the lead when Willem II ‘keeper, Timon Wellenreuther’s left hand inadvertently diverted Milan Massop’s back post header, following a free kick from the right, into his own net after the ball cannoned back off the German ‘keeper’s right hand upright shortly before the half hour mark. Galvanised by their half time advantage the away side doubled their lead seven minutes into the second half – Ajax loanee, Zakaria El Azzouzi capping a period of concerted pressure by the away side by latching onto a perfectly weighted slide-rule pass from Kevin Vermeulen and stroking the ball beyond the reach of an exposed Wellenreuther before paying tribute to Ajax team mate Abdelhak Nouri by holding aloft a shirt emblazoned with the 20-year-old’s name and number to the crowd. Keen to avoid the struggles of last season, Erwin van de Looi’s side pulled themselves back into the match just after the hour mark through Spanish marksman, Fran Sol – who, beat Alessandro Damen with a sweetly struck volley after controlling a deflected Daniel Crowley cross on his chest. However, try as they might, the home side failed to find a second and it was the away side that came closest to adding to the scoresheet when Stanley Elbers saw his drive from just inside the area cannon back off Wellenreuther’s crossbar. The first week of the 2017/18 Eredivisie campaign was concluded with a six-goal thriller at the Noordlease Stadion as rivals, Groningen and Heerenveen battled out an entertaining 3-3 draw in the Battle of the North on Sunday afternoon. Things appeared to be going the way of the visitors when Morten Thorsby put the away side into the ascendancy from close range with just six minutes on the clock – debutant, Denzel Dumfries picking out the head of the 21-year-old Norwegian after a period of sustained pressure by Jurgen Streppel’s side. Despite losing newly recruited ‘keeper, Warner Hahn to a shoulder injury just seconds later, the result appeared to be going the way of the visiting side when Reza Ghoochannejhad doubled Heerenveen’s advantage five minutes before the break – the Iranian international stabbing home a low Dumfries cross from the right beyond the exposed Sergio Padt. However, eight minutes after the restart a first strike in a Groningen shirt for new recruit, Lars Veldwijk saw the home side claw their way back into the contest – the 25-year-old South African international being slipped in down the left by Jesper Drost before escaping the attentions of both Daniel Høegh and Joost van Aken and slotting the ball past substitute ‘keeper, Wouter van der Steen. Having endured a poor first period, the home faithful were buoyed by their side’s improved second half performance and, after being left aggrieved after seeing an earlier appeal for a spot kick turned down by referee, Pol van Boekel when Mimoun Mahi had appeared to have been tugged back by van Aken shortly before the hour, when van Boekel did eventually point to the spot after adjudging Heerenveen debutant, Lucas Woudenberg to have pushed Drost to the ground the relief was palpable as Mahi made no mistake with the resultant penalty to tie the game up at two-a-piece with eight minutes to play. Yet, just as the home side seemed to be gathering the momentum, Heerenveen retook the lead – Thorsby, who had earlier squandered the chance of bagging his second of the match by striking the outside of Padt’s right hand upright with the goal at his mercy, capitalised on a nice dummy from Henk Veerman to steal in behind the host’s rear guard and tuck the ball past the exposed Padt. But, just as Streppel’s side seemed set to take all three points back to the Abe Lenstra Stadion, referee van Boekel once more pointed to the spot – the official adjudging van Aken to have held back Lars Veldwijk just outside the box, leaving Mahi to step up and send van der Steen the wrong way to ensure Ernest Faber’s side a share of the spoils two minutes from time.